(Dola, first-time wrimo, loves blogging and writing stories and often combines them for added pleasure). You don’t need to be a philosopher to know that decisions have the power to change lives. But you may need a click-happy person like me to tell you that a click can change lives too. Really! After writing scripts for short school plays, helping my colleagues write numerous speeches and blogging for pleasure, I finally prepared myself to take a giant leap – to write a novel. I was a voracious novel reader but was I prepared to write one? It can’t be denied, I needed help. And who better to ask than Google Baba? I was skeptical when I clicked the National Novel Writing Month link. A novel in a month? Looked far-fetched. But, I can vouch for it now that that fateful click in October 2012 changed my life forever. Resolving to lock my inner editor out, I began my become-a-novelist-in-a-month journey last November. All I wanted from the deal was the first 50k words of my first draft and the coveted purple ribbon of the winner. What I received was much more. I received the blessing of friendship, of camaraderie. I now belonged to a community that believed in companionship, made you holler with laughter, shared their best practices, agreed to help without you even asking, kept you updated with latest news from the writing world and most importantly took joy in your achievements and motivated you despite the rejections. Even now, I remember the late night writing exercises, fingers flying on the keyboard mostly to bizarre prompts and our India ML cheering us on to touch the winning mark. I felt nostalgic as if I was back in my university hostel and studying late night with friends. I made the acquaintance of published authors, soon-to-be-published authors, great storytellers and even newbies like me. I took part in many contests, won a few and lost many more. But I would never forget the help extended to me by my fellow wrimos who were themselves keeping a tight schedule. I would never forget the ever ready I-will-be-glad-to-help-you messages and the easy smiles, the helpful nudges in the right direction and the cheerful pats on the back. When you know you are not alone in a journey it becomes more interesting. I know I am a better human being today, a better struggling-to-be-published writer. And the credit goes to NaNoWriMo. If you are planning to attempt Nanowrimo this question gains importance in the last week of October. NaNoWriMo is about writing 50K words of a novel. A story. It is always about stories, isn’t it? The first stories are at the knees of the grandmothers (Mine wasn’t, but that’s another post). And then it is the Magic Far-away Trees and school capers and later about the many grey shades of relationships, the mix interspersed with varied individual choices. Stories are everywhere, aren’t they? The Mahabharat and the Ramayan tell us the epic ones. Aesop’s Fables tell us the moral ones. And real-life tells us its own. Newspapers abound with stories; sometimes facts are much stranger than fiction. Stories hide in non-fiction books and they even hide in unexpected words. There are stories in the food-courts of the malls. They are concealed in the passengers of the metro. They are there in the backyard of your own life. My life is so boring, you say (Ok, I am not talking about Siddharth Mallya, here). It is. Excitement comes in small packages to make the monotony of daily life bearable. Grab those exciting experiences and write about them. Or better still enhance those boring bits and make life exciting for your protagonist. There are no limits for what your characters can do. Live through them? If you must, then do. With authenticity and an interesting turn of phrase. This is even more fun when you are a first-time wrimo. There is so much story just bubbling to come out that even 50K words begin to seem less. Make the most of this cornucopia. And if you ever harbor a desire to be an author, this is an experience you cannot afford to not have. You will cherish it forever. So, have you decided what you are going to write about this November? (“Typically, when I think about miracles, I compose,” says Vaishali Jain, a first-time Wrimo, who is also an ardent blogger and a ‘proud child of the 90s’. The love-hate relationship she shares with her muse finds expression in her blog, Cosmuse. Vaishali originally posted this immediately after NaNoWriMo 2012). November this year has not been super rocking for me owing to night-outs with my muse and the mosquitoes. Yes… mosquitoes! Nights in Delhi are full of those ruthless, noisy, attention-grabbing, virus-injecting things. As luck would have it, my fickle muse tends to go altruistic with ideas as the non-starry nights beckon every sane human to sleep. But I’m not the only one in the party. I hear, many artists are graciously visited by their muse at inconvenient times. Is there anything you can do to change it? No. Is there anything you can do to derive a benefit from it? Fortunately, yes! Don’t want to put your ideas in jeopardy? Then, you should record them… and immediately. Go for whichever way suits you – The digital way or the notebook way. Write on small notebooks, stick-ons, spare notepapers or even text yourself through your mobile. When you go to bed, keep a paper and pen beside your pillow. I’ve been able to save many of my story ideas because of this one action-step. Take a shower. Some say, it’s then when they get the best ideas. Oh, and please keep a waterproof notepad with you. You might take it casually and miss out on some of the best ideas so please take note of it… there is inspiration everywhere. You just need to look around and notice. Go for drives, walks, or just look outside the window. And, at all times, be prepared to record your observations. Talk to someone, known or unknown. Listen to music – with or without lyrics. Read newspapers/ magazines… Innumerable ideas in those pictures and Sunday articles. Take ideas from the books that inspire you. The daily chores – this is when you can actually cut away from the mundane and think wholeheartedly about your genius story. Go people-watching. Study them. In your local supermarket or your nearby mall or your fave café or your cousin’s place or your metro/train/bus/etc. It SO helps in characterization. Talk to your characters. Did you know that’s one of the best ways to avoid writer’s block, too? Journals – they can bring up interesting topics to write on. Visit them once in a while, if you have one. If you don’t have one, then have one. I, by no chance, can promise to make it an easy ride for you but I hope it does become an easier one and we sail through these 30 days with a ready first draft of our novels and plenty of confidence to dare going for such expeditions again… together. 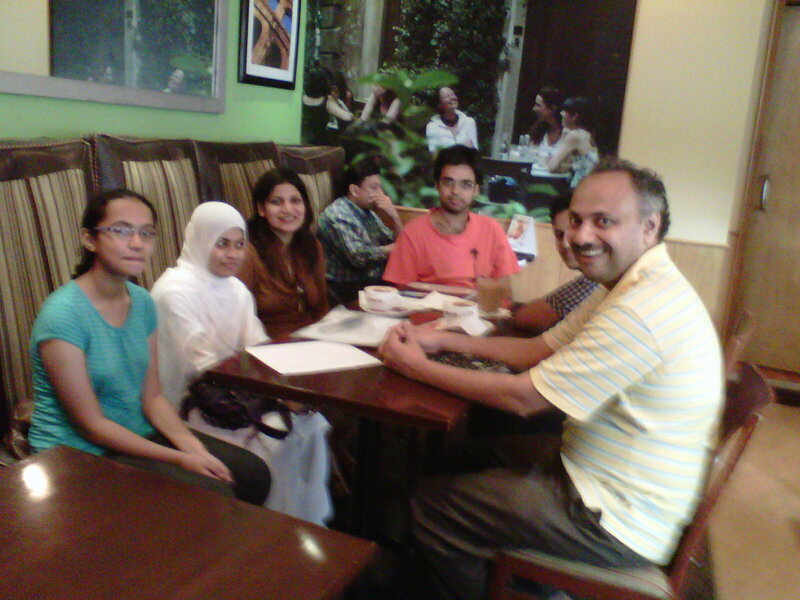 The first ever NaNoWriMo event in Mumbai (and India) was the Kick-off meet held on Sunday 30th October, 2011 at Costa Coffee, Juhu. With an eclectic crowd consisting of writers from Bhayander to Matunga, this meet, which began at 3pm, was suffused with enormous enthusiasm for completing the requisite 50K words of a novel in the month of November. The meet began with introductions and as each one spoke about their ideas and concepts of their novels, their individual and collective concerns were also addressed satisfactorily. Most of the participants in the meet were attempting NaNoWriMo for the very first time and the exuberance tinged with apprehension was very apparent, but by the time the meet ended at 5pm, all the participants were convinced that they were now well-equipped with information to enable them to win the competition. It was also very motivating for the excited novelists-in-waiting to know that two nano novels have been recent No.1 bestsellers: ‘Water for Elephants’ by Sara Gruen (also made into a movie) and ‘The Night Circus’ by Erin Morgenstern. Q) Do I have to write my story online and do I have to leave my story online for everyone to read? A) Absolutely not. Each one will have to write their story on their own device, whether it is a PC, laptop, smartphone (you need really nimble fingers, here) or even a book. You can post the synopsis and an excerpt of your book if you so wish but it is not mandatory. Q) How can I possibly write 50K words in 30 days? A) Wouldn’t it be lovely if all other life things were taken care of while we wrote our novels? It would be a good idea to make a schedule with time marked out for writing. If time doesn’t permit you to write at a stretch, write in snatches of 15minutes in between all your other chores and responsibilities. Q) A blank page is very intimidating. What is the best way to start a novel? A) To prevent ‘Writer’s Block’ on espying a blank page, start not with the first but the second chapter. You can come back to it later. If this doesn’t sound right, you could actually start writing about how stuck you are and get into the flow. It is inevitable that the right words will emerge. Another way is to never end your day’s writing at the end of a scene. Leave a little bit of it for the next time so that you don’t have a blank mind facing a blank page the next time you sit down to write. What measures are you taking to ensure you complete your novel? (This post by Sonia Rao, NaNo ML for India, was first posted immediately after the First ever NaNoWriMo Kick-off meet held in Mumbai). (Prem Rao’s debut novel “It Can’t Be You” is a NaNoNovel and so is the next one, “Lucky For Some, 13” which was launched in December 2012. Posted here is a quick chat with Prem Rao about his Nano experiences and insights, which took place in the last week of NaNoWriMo 2012). Sonia Rao: Prem, this is your fourth NaNo and judging by your current word count, this year too seems to be a winning one for you. Heartiest Congratulations. Tell us, when and how did you hear of NaNoWriMo? Prem Rao: Thank you, Sonia. This year will make it 4/4 for me and I am very excited about it. I knew of NaNoWriMo since 2004 or so, mentioned to me by a friend in the US. I didn’t have the time till 2009 to give it a shot. Also, I had the wrong impression, because of its name, that it was only for folk in the US. Sonia Rao: What were your personal circumstances (job, retirement…) when you first attempted NaNo? Prem Rao: I was still running my business in 2009. I retired post my heart surgery in July 2010. NaNo 2010 was that much easier for me, as were the ones to follow. By then I had been there, done that; learnt from the experience essentially, what to do and what to avoid and so on. Sonia Rao: What does NaNoWriMo mean to you? Prem Rao: I owe so much to NaNo. It wouldn’t be wrong to say that whatever I have achieved as a writer till date is primarily because of NaNoWriMo. I have often said that dreams remain dreams until an event comes along that acts like a catalyst to move those idle dreams to purposeful actions. For me, NaNoWriMo was that catalyst. In November 2009, I wrote the first 50,000 words of a psychological thriller, “It Can’t Be You” which went on to become my debut novel when it was published in November 2010. This made me arguably the first person from out of India to have a debut novel published from a debut effort at NaNo. Likewise, in November 2010, I wrote the first 50,000 words of “Lucky For Some, 13” and guess what? On December 1, 2012 that book is being launched. Sonia Rao: 4 years of NaNo must have offered you many insights about how to successfully tackle it. Could you share some of them with us? Do what works best for you? Write in the mornings, evenings, nights whenever it suits you, but write you must, every single day. Don’t fall too much behind the asking rate of 1667 words per day. If you are ahead of the game, so much the better. I always try to be ahead of the curve because there are some days when it is difficult to achieve your daily target. Don’t try to edit as you write. That slows you down. At least, it does for me. My mantra:“write at speed, edit at leisure.” You can edit to your heart’s content, as you will need to do, of course, after November ends. Learn from others and share. Participate in the NaNo forums. I learnt so much from interactions there. You will meet so many people who are helpful with ideas and experiences. We are truly a great global community. Be positive. It’s fun to compete with others. There are some who are miles ahead of you, but don’t lose heart. Heck, there are thousands who are behind you. Look at it like a game of golf, where you are really competing against yourself. The targets are known. There is no ambiguity at all about this. Where you are is known, virtually on a minute to minute basis. What else do you need to finish the course? End strongly. Don’t lose your momentum towards the end, whatever your wordcount. Sonia Rao: There are seven days left of NaNoWriMo. Any tips for those wrimos who are lagging behind with their word counts and/ or having second thoughts? Prem Rao: There is some magic in the NaNoWriMo month which seems to make time whiz by faster than usual. Believe me, the thrill of successfully completing NaNoWriMo is the same, whether it is the first year for you or the fourth. It’s a test of your interest and your skill. Go for it and get the satisfaction of being one amongst a small percentage which ends up as winners. The biggest mistake you can make is to allow all the hard work to go waste by slackening towards the end. There is time left till November 30. Go for it. Finish strongly. The last burst makes the difference between victory and defeat. Sonia Rao: This is stupendous encouragement for all wrimos, Prem. And now, time for us all to go back to writing. Thank you and wishing you more and more successful NaNoWriMos and more and more successful novels, in the future. Prem Rao: Thank you, Sonia. DID YOUR NANONOVEL MAKE YOU CRY? No, not the whingeing and the whining, victim-type of crying. And certainly not when things don’t go my way. More often than not I would rather tackle that ‘with a blow in the teeth of a wrong’ than cry. I cry when I hear the National Anthem being played in the cinema hall before the movie begins and I am glad for the darkness that hides the surreptitious tear that slides down my cheek. I cry (in a nice way) when I read a Mitch Albom. (It’s truly an emotional hazard to read Albom’s books in public). I cry when I read soul-touching poetry written by my favourite poets. Hachiko and Happy feet had me bawling (silently) while Taare Zameen Par had me bawling (continuously and loudly) for many days after. And I am sure if I were to eat Bhut Jolokia, gallons of drinking water would not be able to stop the teary deluge. And then one day, I cried while writing. Having reached a dead-end in my nano novel, 3 years ago, I did what all wrimos do when the word count is at stake, I started rambling. Suddenly I found my Second Lead Male Character at the doctor’s. Rohit (my SLMC) was a 30-year old dynamic go-getter who had been stationed abroad to set up his company’s office. His young wife, wanting to pursue her career, had decided to stay back. They had been brave about this separation but in a few months they realised they hated living apart. One of them would compromise (a toss of the coin would decide that). Rohit had come down for a visit to tie up loose ends. The young couple was on top of the world and had stars in their eyes and love in their hearts as they discussed things all lovers and newly-weds do, about their love, their lives and starting their family. A nagging dull ache in his left arm and his young wife’s persistence had forced Rohit to visit the doctor. A routine check-up really, Rohit and I thought. “This portion has to go when editing” was the thought even as I continued writing. There were many patients that day and it was almost two hours later that the receptionist ushered them into the doctor’s consulting room. Rohit had been feeling a bit queasy even as he waited for his turn and as he now sat down in the chair he started coughing. In the middle of the coughing bout, Rohit collapsed, hit his head on the edge of the table and then he was still. His wife screamed and the doctor, caught unawares, tried to resuscitate him and finally called for the ambulance to take him to the hospital. “Stop, stop, this can’t be happening to them, such a sweet couple with such a bright future.” Silently I screamed but my fingers refused to stop writing. “Sorry, we have to declare him DOA- Dead on Arrival,” Nilima, his young wife fainted on hearing these words, such hateful words. As the writer I wanted to delete these words, this couple deserved to see their bright future, the way they had been envisioning for days and months. The words on the screen were blurred, my cheeks were wet but my fingers refused to stop writing. (No wonder writers prefer to write in solitude). Yes, I did continue writing till I had placed Nilima in the loving hands of the Female Main Lead. And it took an extra hour at the gym to shake off the dismal mood and get the endorphins flowing. Have you ever had such an experience while writing? Did you ever get overcome by emotion (sad, happy, jubilant…) while writing a scene? 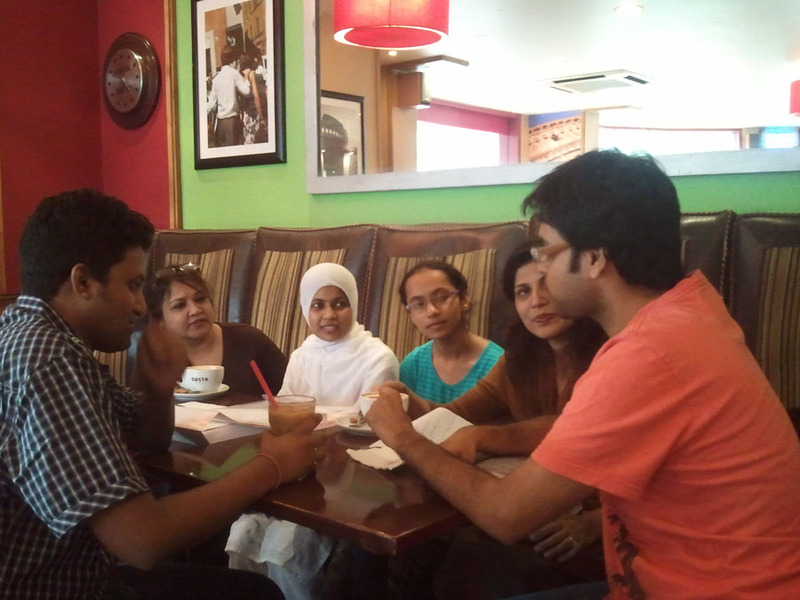 (This guest post which is the first indigenous pep-talk for Indian Wrimos by a published Indian author was written by Ms. Minal Hajratwala during NaNoWriMo 2012. It is but befitting to re-post it now that Camp NaNoWriMo is in full swing). Halfway through, it’s about time we start thinking about failure. I’ve already written ##,000 words. I’m out of ideas, my fingers hurt, and my dog misses me. Plus it’s the holidays. Maybe I should quit while I’m ahead. I’ve barely written #00 words. I’m a zero, basically. I’ll never catch up now. Why bother? I’m going to the NaNo FAQs to see if I can take my profile down. What do we do when faced with the great gaping jaws of failure? I often wish I could be one of those cool-headed, even-keeled writers who pumps out a steady stream of prose during the 9-to-5 hours and then gets to go out for beer and biryani. Maybe you’re one of them. If so, congrats to you! I don’t hate you. No, really I don’t. A little envy, maybe. What, I look green? That’s just because one of my characters has been ingesting Paris Green. The truth is, I’m not that kind of writer. Never have been. I despise the 9-to-5. I sleep through most mornings. My favorite writing time zone is 1am to 3am. I don’t drink beer. And the more I remember these things about myself, instead of sulking and envying, the more writing I get done. What about you? What kind of writer are you? As you pump (crawl?ooze?) your way through NaNoWriMo, don’t forget to notice what you’re learning about yourself and your writing. What are your inner critical voices saying, and how are you getting past them — or not? What time of day works best for you? What boosts or saps your energy? When do you love writing? When do you resent the heck out of it? What do you do when you think you “should be” writing? What habits have you developed to avoid your writing? How can you defeat your own self-defeating habits? These questions, and what you notice about your writing, will serve you long after November 30, whether you meet your goal or not. By this point in my writing life, I know my habits pretty well. When I’m not writing, I’m often checking my email or Facebook. As a working writer and writing coach who is gearing up for a book tour, I actually have legitimate reasons for being online. (You probably do, too). The other morning, for example, instead of writing, I replied to an interview request from the BBC, updated my website events page, publicized an upcoming workshop by posting it to some Facebook groups, scheduled a coaching call with a client, and went online to order a new bookshelf for my writing room to take advantage of a 25% discount — all valiant, justifiable uses of my time. And yet… the whole time, I knew I was avoiding my NaNo novel. I’d write an email and think, “I should do this later and write now.” I’d pen some scintillating marketing prose and think, “I should be writing my novel now, not this.” After all, it wasn’t as though I had no free time at all; I also cuddled the dog, took a long nap, and played a video game. And then, eventually, after all that, niggled by the nagging feeling (or nagged by the niggling feeling) that I was behind schedule, and haunted by the (again legitimate, justifiable!) lack of writing for the previous two days … I wrote. I got over the voice saying “failure, failing, fail” by admitting that, yes, it’s true. I might completely, utterly fail. At my novel. At my life. I actually only have 19 writing days available in November, so my goal has been to write 2,632 words per day. Whew! So far, I’ve mostly failed. I’ve met that daily target only once. But I’m writing. I’ve written on days I thought I wouldn’t be able to; I’ve surprised myself with both my devotion as well as my apparently not-yet-tapped capacity for procrastination. My novel is growing, and I’m understanding the characters better. I haven’t lost the plot; hey, look, I even have subplots! Your mileage and methods may vary. When I met our fantastic India ML for a quick co-writing session in Mumbai, she noticed that I write longhand. Yes, I’m old school. Eventually I move onto the computer, but I write in notebooks. How do you count? she asked. I use an average words-per-line, roughly approximating each page as I go. When I’m stuck, I write directly about the process of being stuck. It usually helps me figure something out and get moving. This counts; this is work on my novel. I’ve also made a four-pages-and-growing list of freewrite topics, so that I can just grab one and go in each writing session — one of the strategies I suggest for my writing students and clients. Don’t have a topic list? Make one (yes, that list of words counts toward your total! ), or follow the NaNo sprints on Twitter, or just email me and I’ll send you my 10-Minute Writing For Muscles of Steel exercises. It’s all good. There’s no wrong way to do this. Write on your own personal timezone. Write blindly, not even looking at what you’re typing. Write long nasty letters to your own inner critics. But write. And if your inner editor is whispering lots of sweet-nothings about failure, join me in the goal I’ve set for this month: to become the most verbose, wordy, prolific failure in the history of literature. (Minal Hajratwala is the author of the award-winning nonfiction book Leaving India: My Family’s Journey From Five Villages to Five Continents (2009), as well as the editor of Out! Stories From the New Queer India (2012), the first anthology of LGBT literature published since the decriminalization of homosexuality in India. As a writing coach, she has taught workshops nationally and internationally at universities, online, and via community organizations including the Voices of New America summer program on the University of California-Berkeley campus. A graduate of Stanford University, she has held fellowships at the Columbia University Graduate School of Journalism and as a Fulbright Senior Research Scholar).